Prime Building Advantage will be directing sales and marketing at The Appleton, a five unit, luxury appointed condominium located at 2024 16th St., NW. Washington, D.C. This new property is built by Redwood Ventures, a local DC-based developer with successful design and build projects in Washington, D.C. The firm is known for revitalizing underutilized residential and commercial properties, and working to preserve each space within its historic neighborhood. The name Appleton pays respect to famed Washington, D.C. architect, Appleton P. Clark Jr. whose designs in the 19th and 20th centuries still fill Washington, D.C. and provide the city with its distinctive look. 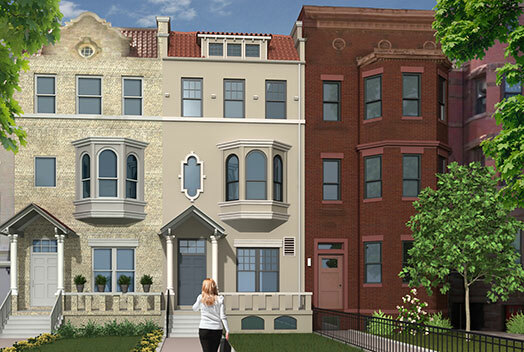 The property, which is a completely renovated row house, features a mixture of 1, 2, and 3 bedroom residences. Each property has been luxuriously appointed with high end appliances and finishes and modern layouts. Parking is also available.